Gastro-esophageal reflux disease (GERD) is a common condition where stomach acid leaks out of the stomach and into the esophagus (gullet). The esophagus is a long tube of muscle than runs from the mouth to the stomach. Many people experience occasional episodes of GERD, but if people have persistent and reoccurring symptoms it is normally regarded as a condition that needs treatment. A step-by-step approach is usually recommended for GERD. This means that relatively uncomplicated treatments, such as changing your diet, will be tried first. If this fails to help control symptoms then a person can be 'stepped up' to more complex treatments such as antacids, which help neutralise the effects of stomach acid. In cases where medication fails to control symptoms, surgery may be required. It is thought that GERD is caused by a combination of factors. The most important factor is the lower oesophageal sphincter (LOS) muscle not working properly. The LOS acts like a valve, opening to let food fall into the stomach and closing to prevent acid leaking out of the stomach and into the esophagus. In cases of GERD, the LOS does not close properly, allowing acid to leak up, out of the stomach. A common complication of GERD is that the stomach acid can irritate and inflame the lining of the esophagus, which is known as oesophagitis. In severe cases of oesophagitis, ulcers (open sores) can form which can cause pain and make swallowing difficult. A rarer and more serious complication of GERD is cancer developing inside the esophagus (oesophageal cancer). GERD is a common digestive condition. It is estimated that one in five people will experience at least one episode of GERD a week, and that 1 in 10 people experience symptoms of GERD on a daily basis. GERD can affect people of all ages, including children. However, most cases affect adults aged 40 or over. GERD is thought to affect both sexes equally, but males are more likely to develop complications. The outlook for GERD is generally good, and most people respond well to treatment with medication. However, relapses are common, with around half of people experiencing a return of symptoms after a year. As a result, some people may require a long-term course of medication to control their symptoms. These symptoms are discussed in more detail below. Heartburn is a burning pain or a feeling of discomfort that develops just below your breastbone. The pain is usually worse after eating, or when bending over or lying down. Regurgitation of acid usually causes an unpleasant, sour taste at the top of your throat or the back of your mouth. Around one in three people with GERD has problems swallowing (dysphagia). It can occur if the stomach acid causes scarring of the esophagus, which leads to the esophagus narrowing, making it difficult to swallow food. People with GERD-associated dysphagia say it feels like a piece of food has become stuck somewhere near their breastbone. GERD can sometimes have a number of less common symptoms associated with the irritation and damage caused by stomach acid. If you have asthma and GERD, your asthma symptoms may get worse as a result of stomach acid irritating your airways. If you are only experiencing symptoms such as heartburn once or twice a month, then you probably do not need to seek treatment from Dr. B C Shah. You should be able to control symptoms by making a number of lifestyle changes and using over-the-counter medication as and when symptoms occur. 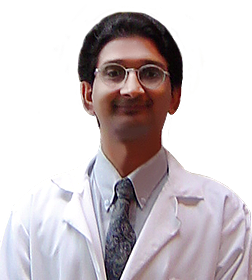 You should see Dr. B C Shah if you are having frequent or severe symptoms and finding yourself using over-the-counter medication on a weekly or daily basis. You may require prescription medication to control symptoms and prevent complications. It is thought that most cases of gastro-oesophageal reflux disease (GERD) are caused by a problem with the lower oesophageal sphincter (LOS) muscle. The LOS is located at the bottom of the esophagus (gullet), the tube that runs from the back of the throat to the stomach. The LOS works in a similar way to a valve. It opens to let food into your stomach, and it closes to prevent acid leaking back up into your esophagus. However, in people with GERD, the LOS can become weakened, which allows stomach acid to pass back into the esophagus. This causes symptoms of heartburn, such as a burning pain or a feeling of discomfort in your stomach and chest. Exactly what causes the LOS to become weakened is not always clear, but a number of risk factors have been identified. There is also a condition called gastroparesis, where the stomach takes longer to dispose of stomach acid. The excess acid can push up through the LOS. Gastroparesis is common in people who have diabetes, because high blood sugar levels can damage the nerves that control the stomach. There are a number of medications that can relax the LOS, leading to the symptoms of GERD. In most cases, Dr. B C Shah will be able to diagnose gastro-oesophageal reflux disease (GERD) by asking questions about your symptoms. Further testing aims to confirm or disprove the diagnosis of GERD while checking for any other possible causes of your symptoms, such as irritiable bowel syndrome. An endoscopy is a procedure where the inside of your body is directly examined using an endoscope. An endoscope is a long, thin flexible tube that has a light source and video camera at one end so that images of the inside of your body can be sent to an external monitor. To confirm a diagnosis of GERD, the endoscope will be inserted into your mouth and down your throat. The procedure is usually done while you are awake, and you may be given a sedative to help you to relax. An endoscopy is used to check whether the surface of your esophagus has been damaged by stomach acid. It can also rule out more serious conditions that can also cause heartburn, such as stomach cancer. If an endoscopy does not find any evidence of damage to your esophagus, you may be referred for a further test called manometry. Manometry is used to assess how well your lower oesophageal sphincter (LOS) is working by measuring pressure levels inside the sphincter muscle. During manometry, one of your nostrils will be numbed using a topical anaesthetic. A small tube will then be passed down your nostril and into your esophagus to the site of the LOS. The tube contains a number of pressure sensors, which can detect the pressure generated by the muscle, then send the reading to a computer. During the test, you will be asked to swallow some food and liquid to check how effectively your LOS is functioning. However, these side effects should pass quickly once the test has been completed. Manometry can be useful for confirming a diagnosis of GERD, or for detecting less common conditions that can disrupt the normal workings of the LOS, such as muscle spasms or achalasia (a rare swallowing disorder). If you are experiencing symptoms of dysphagia then you may be referred for a test known as a barium swallow. The barium swallow test is one of the most effective ways of assessing your swallowing ability and finding exactly where the problems are occurring. The test can often identify blockages or problems with the muscles used during swallowing. As part of the test, you will be asked to drink some barium solution. Barium is a non-toxic chemical that is widely used in tests because it shows up clearly on an X-ray. Once the barium moves down into your upper digestive system, a series of X-rays will be taken to identify any problems. If you need to have a barium meal X-ray, you will not be able to eat or drink anything for at least six hours before the procedure so that your stomach and duodenum (top of the small intestine) are empty. You may be given an injection to relax the muscles in your digestive system. You will then lie down on a couch and your specialist will give you a white, chalky liquid to drink which contains barium. As the barium fills your stomach, your specialist will be able to see your stomach on an X-ray monitor, as well as any ulcers or abnormal growths. Your couch may be tipped slightly during the test so that the barium fills all the areas of your stomach. A barium swallow usually takes about 15 minutes to perform. Afterwards you will be able to eat and drink as normal, although you may need to drink more water to help flush the barium out of your system. You may feel slightly sick after a barium meal X-ray, and the barium may cause constipation. Your stools may also be white for a few days afterwards as the barium passes through your system. If the manometry test cannot find problems with your oesophageal sphincter muscles, another test known as 24-hour pH monitoring can be used (pH is a unit of measurement used in chemistry, and describes how acidic a solution is). The lower the pH level, the more acidic the solution is. The 24-hour pH monitoring test is designed to measure pH levels around your esophagus. You should stop taking medication used to treat GERD for seven days before having a 24-hour pH test because the medication could distort the test results. During the test, a small tube containing a probe will be passed through your nose to the back of your esophagus. This is not painful but can feel a little uncomfortable. The probe is connected to a portable recording device about the size of an MP3 player, which you wear around your wrist. Throughout the 24-hour test period, you will be asked to press a button on the recorder every time you become aware of your symptoms. You will be asked to complete a diary sheet by recording when you have symptoms upon eating. Eat as you normally would to ensure an accurate assessment can be made. After the 24-hour period is over, the probe will be removed so measurements on the recorder can be analysed. If test results indicate a sudden rise in your pH levels after eating, a confident diagnosis of GERD can usually be made. A number of self-care techniques may help relieve symptoms of gastro-oesophageal reflux disease (GERD). They are described below. If you are overweight, losing weight may help reduce the severity and frequency of your symptoms because it will reduce pressure on your stomach. If you are a smoker, consider quitting. Tobacco smoke can irritate your digestive system and may make symptoms of GERD worse. Eat smaller, more frequent meals, rather than three large meals a day. Make sure you have your evening meal three to four hours before you go to bed. Be aware of triggers that make your GERD worse. For example, alcohol, coffee, chocolate, tomatoes, or fatty or spicy food. After you identify any food that triggers your symptoms, remove them from your diet to see whether your symptoms improve. Raise the head of your bed by around 20cm (8 inches) by placing a piece of wood, or blocks under it. This may help reduce your symptoms of GERD. However, make sure your bed is sturdy and safe before adding the wood or blocks. Do not use extra pillows because this may increase pressure on your abdomen. If you are currently taking medication for other health conditions, check with DR. B C Shah to find whether he may be contributing to your symptoms of GERD. Alternative medicines may be available. Do not stop taking a prescribed medication without consulting Dr. B C Shah first. Depending on how your symptoms respond, you may only need medication for a short while or alternatively on a long-term basis. A number of over-the-counter medicines can help relieve mild to moderate symptoms of GERD. Antacids are medicines that neutralise the effects of stomach acid. However, antacids should not be taken at the same time as other medicines because they can stop other medicines from being properly absorbed into your body. They may also damage the special coating on some types of tablets. Ask Dr. B C Shah for advice. Alginates are an alternative type of medicine to antacids. They work by producing a protective coating that shields the lining of your stomach and esophagus from the effects of stomach acid. If GERD fails to respond to the self-care techniques described above, Dr. B C Shah may prescribe a one month course of proton-pump inhibitors (PPIs) for you. PPIs work by reducing the amount of acid produced by your stomach. Most people tolerate PPI well and side effects are uncommon. In order to minimise any side effects, Dr. B C Shah will prescribe the lowest possible dose of PPIs that they think will be effective in controlling your symptoms. Therefore, inform Dr. B C Shah if he can prescribe PPIs for you that prove ineffective. A stronger dose may be needed. Sometimes, the symptoms of GERD can return after a course of PPIs has been completed. Go back to see Dr. B C Shah if you have further or persistent symptoms. In some cases you may need to take PPIs on a long-term basis. If PPIs cannot control your symptoms of GERD, another medicine known as an H2-receptor antagonist (H2RA) may be recommended to take in combination with PPIs on a short-term basis (two weeks), or as an alternative to them. H2RAs block the effects of the chemical histamine, used by your body to produce stomach acid. H2RAs therefore help reduce the amount of acid in your stomach. Some types of H2RAs are available as over-the-counter medicines. These types of HR2As are taken in a lower dosage than the ones available on prescription. Ask Dr. B C Shah if you are not sure whether these medicines are suitable for you. If your GERD symptoms are not responding to other forms of treatment, Dr. B C Shah may prescribe a short-term dose of a prokinetic. Prokinetics speed up the emptying of your stomach, which means there is less opportunity for acid to irritate your esophagus. If you have the above symptoms while taking prokinetics, stop taking them and contact Dr. B C Shah or out-of-hours doctor immediately. He may recommend your dose is discontinued. Extrapyramidal symptoms should stop within 24 hours of the medicine being withdrawn. Prokinetics are not usually recommended for people under 20 years old because of an increased risk of extrapyramidal symptoms. Surgery is usually only recommended in cases of GERD that fail to respond to the treatments listed above. Alternatively, you may wish to consider surgery if you have persistent and troublesome symptoms but do not want to take medication on a long-term basis. Discuss the advantages and disadvantages of surgery with Dr. B C Shah before making a decision about treatment. These procedures are discussed below. Laparoscopic nissen fundoplication (LNF) is one of the most common surgical techniques used to treat GERD. LNF is a type of keyhole surgery that involves the surgeon making a series of small incisions (cuts) in your abdomen (tummy). Carbon dioxide gas is then used to inflate your abdomen to give the surgeon room to work in. During LNF, the surgeon will wrap the upper section of your stomach around your esophagus and staple it in place. This will contract (tighten) your lower oesophageal sphincter (LOS), which should prevent any acid moving back out of your stomach. LNF is carried out under general anaesthetic, which means you will not feel any pain or discomfort. The surgery takes 60 to 90 minutes to complete. After having LNF, most people can leave hospital once they have recovered from the effects of the general anaesthetic. This is usually within two to three days. Depending on the type of job you do, you should be able to return to work within three to six weeks. For the first six weeks after surgery, it is recommended you only eat soft food, such as mince, mashed potatoes or soup. Avoid eating hard food that could get stuck at the site of the surgery, such as toast, chicken or steak. In the last decade, a number of new surgical techniques have been introduced for the treatment of GERD. All techniques discussed below are non-invasive, which means no incisions need be made into your body. Therefore, they can usually be performed under local anaesthetic on a day surgery basis, so you should not have to spend the night in hospital. Endoscopic injection of bulking agents involves the surgeon using an endoscope to find the site where stomach and esophagus meet (known as the gastro-oesophageal junction). A thin tube called a catheter is then passed down the endoscope, and used to inject a combination of plastic and liquid into the junction. This narrows the junction and helps to prevent acid leaking up from the stomach. The most common side effect of this type of surgery is mild to moderate chest pain. This develops in around a half of all cases. Endoluminal gastroplication involves the surgeon using an endoscope to sow a series of pleats (folds) into the LOS. The pleats should restrict how far the LOS can open, preventing acid leaking up from your stomach. These side effects should improve within a few days. Endoscopic augmentation with hydrogel implants is a similar technique to an endoscopic injection, except the surgeon uses hydrogel to narrow your gastro-oesophageal junction. Hydrogel is a type of flexible plastic gel very similar to living tissue. The most common complication arising from this procedure is that the hydrogel starts to come out of the gastro-oesophageal junction. One study found this happened in one in five cases. However, this is a relatively new technique and success rates may well improve in future. In endoscopic radiofrequency ablation, the surgeon passes a balloon down an endoscope to the site of your gastro-oesophageal junction. The balloon is then inflated. Tiny electrodes are attached to the outside of the balloon and small pulses of heat generated. This creates small scars in the tissue of your esophagus, causing it to narrow and making it more difficult for stomach acid to leak out of your stomach. A new type of surgery introduced in 2011, is the LINK Reflux Management System. This type of keyhole surgery uses magnetic beads to reinforce the LOS muscle. The magnetic force of the beads helps keep the LOS closed when at rest, preventing stomach acid leaking upwards. The LOS opens normally when swallowing. This type of surgery appears effective and safe in the short-term but as it is a new technique, its long-term effectiveness and safety are unclear. The excess acid produced by gastro-oesophageal reflux disease (GERD) can damage the lining of your esophagus (esophagitis) which can lead to the formation of ulcers. The ulcers can bleed, causing pain and making swallowing difficult. Ulcers can usually be successfully treated by controlling the underlying symptoms of GERD. Medications used to treat GERD can take several weeks to become effective, so it is likely Dr. B C Shahwill recommend additional medication to provide short-term relief from your symptoms. Both antacids and alginates are over-the-counter medications available from pharmacists. The pharmacist will advise you on the types of antacid and alginate most suitable for you. Antacids are best taken when you have symptoms, or when symptoms are expected, such as after meals or at bedtime. Alginates are best taken after meals. Repeated damage to the lining of your esophagus can lead to the formation of scar tissue. If the scar tissue is allowed to build up, it can cause your esophagus to become narrowed. This is known as oesophageal stricture. An oesophageal stricture can make swallowing food difficult and painful. Oesophageal strictures can be treated by using a tiny balloon to dilate (widen) the esophagus. This procedure is usually carried out under a local anaesthetic. Repeated episodes of GERD can lead to changes in the cells lining of your lower esophagus. This is a condition known as Barrett’s esophagus. It is estimated that 1 in 10 people with GERD will develop Barrett’s esophagus. Most cases of Barrett’s esophagus first develop in people aged 50-70 years old. The average age at diagnosis is 62. Barrett’s esophagus does not usually cause noticeable symptoms other than those associated with GERD. The concern is that Barrett’s esophagus is a pre-cancerous condition. This means that while changes in the cells are not cancerous, there is a small risk they could develop into ‘full blown’ cancer in the future. This would then trigger the onset of esophageal cancer (see below). If it is thought that you have an increased risk of developing oesophageal cancer, it is likely you will be referred for regular endoscopies to monitor the condition of the affected cells. If oesophageal cancer is diagnosed in its initial stages, it is usually possible to cure the cancer using a treatment called photodynamic therapy (PDT). PDT involves injecting your esophagus with a medication that makes it sensitive to the effects of light. A laser attached to an endoscope is then placed inside your esophagus and burns away the cancerous cells.